A few weeks ago I posted about a lamp I found at Urban Barn and ordered it for my living room...well, it's finally here! I love it, it works perfectly in the space. It's a smaller, busier version of the Arco floor lamp, complete with marble base. It's perfect for the awkward corner-niche in my living room. Here it is! The marble base of the lamp is repeated on my bar cabinet at the other end of the room. My lighting inspiration came from this lamp, but it arches too wide for my narrow room. The lamp is great for reading under and it reaches across enough of the couch so that I don't need a lamp on the other side, freeing up space in my already too-narrow living room. A table setting at Chatelet. 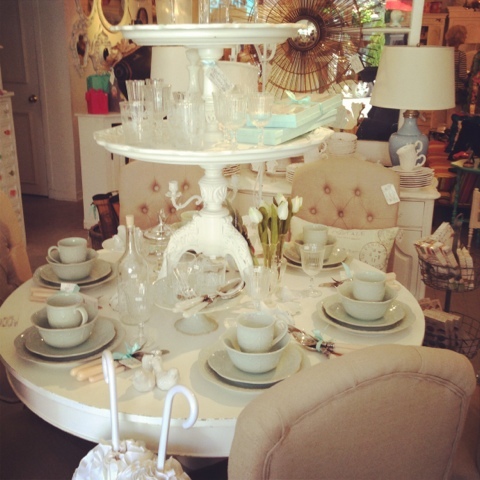 Such beautiful, romantic furniture and decor in this store; very French provincial. 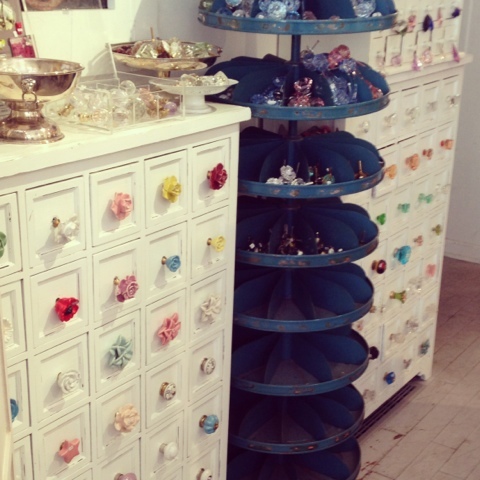 The drawer pulls that I bought at Chatelet - see my blog post about replacing drawer hardware here. I finally found a new lamp for my living room! 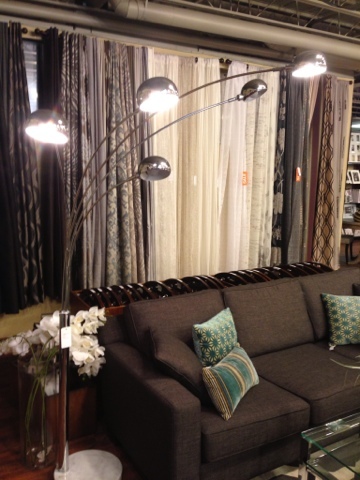 I love the Arco floor lamp (see it here) but it's too wide for my narrow room. This one is not only more suitable for a smaller space, but I like that there are five different light sources instead of just one. The marble base is going to be the perfect anchor for my marble-topped bar cabinet on the opposite side of the room. 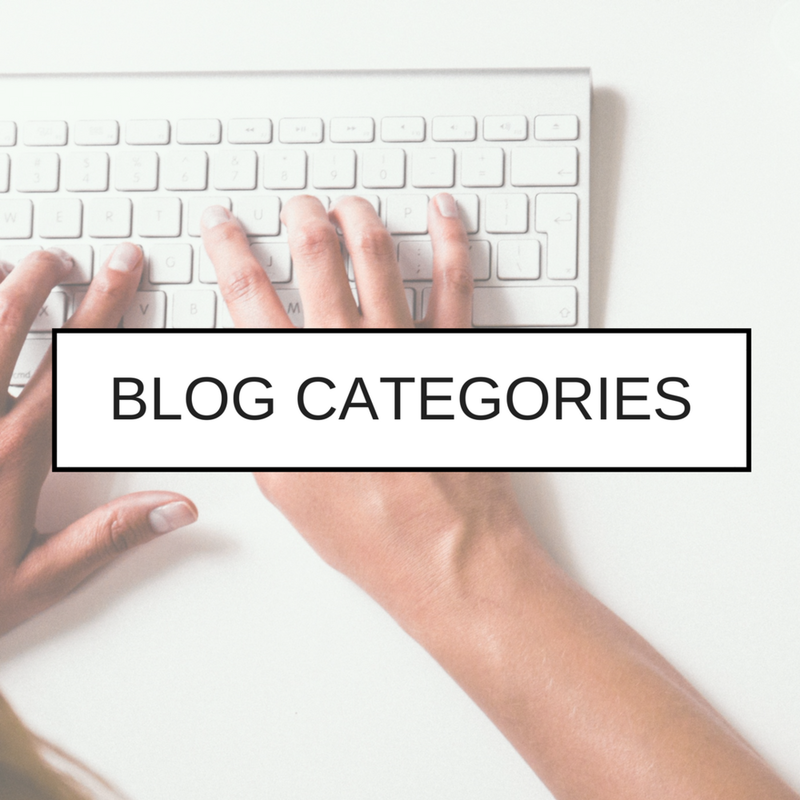 Each light on the fixture swivels side to side for a customizable look. This picture is of the floor model (from Urban Barn); I had to order it as it wasn't in stock so I won't have it for another 2-3 weeks. I can't wait to see it in my space! 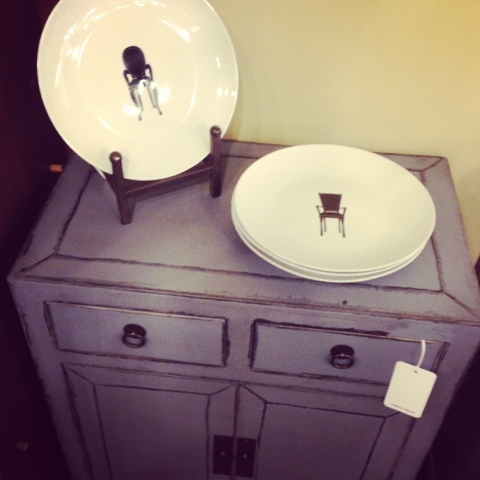 Also from Urban Barn - a cute set of plates decorated with chair sillhouettes on an even cuter dresser/cabinet that has a "reverse tromp l'oeil" effect to it of life imitating art. This was my one and only yard sale find of the day - scored it for only $2 and it actually works! 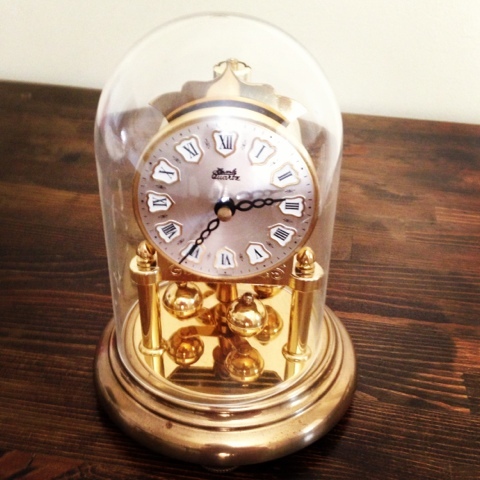 I love it because it reminds me of an identical clock that my grandparents had in their house, so this is my nostalgia piece. I found this trivet in an antique store. 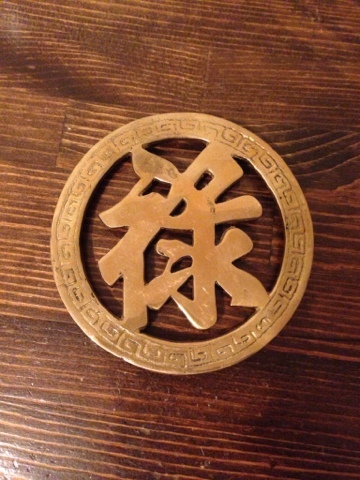 At the time, I didn't know what the Chinese characters meant but I thought it was a really striking image, especially with the Greek key pattern in the surrounding circle. There's a brass hoop on the back to allow the trivet to be hung on the wall, which is exactly what I'm going to do with it as soon as I find a place for it (if I had a home office it would definitely be going in there!). I've since learned from a friend at work that the symbols are pronounced "foo-loo" and it means "prosperity in career." 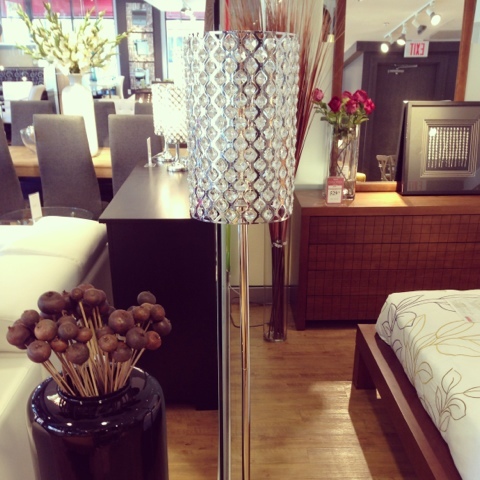 I might go back to Structube and buy this lamp - it is so sparkly and would look great next to my bar cabinet. It's the perfect size, too; I need a slim shade for that corner of the room. 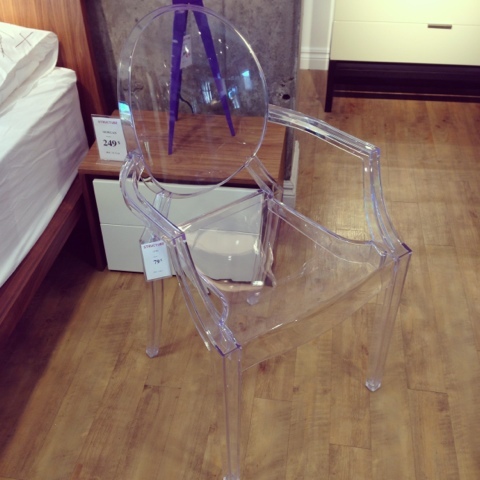 The best price I've seen so far for a replica of the Philippe Starck Louis Ghost Chair - $79 at Structube. This weekend I'll be heading to the Junction to check out the plethora of antique shops that are concentrated in that small neighbourhood. Window shopping only though, unless I see something really inexpensive - that floor lamp I just bought wasn't exactly expensive, but it definitely maxed out the budget for now. I finished my lamp project - it's now got a fresh coat of silver paint and I replaced the tapered shade with a drum shade and re-covered it in houndstooth fabric. Here it is! I found it surprisingly easy to adhere the fabric to the shade using spray adhesive. 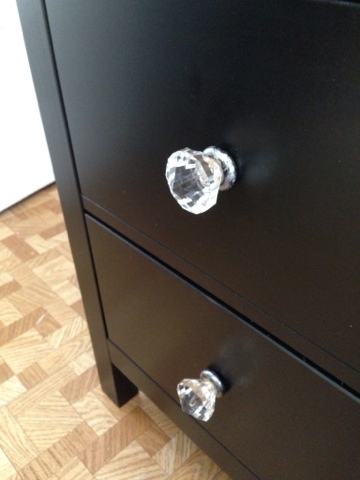 This was such an easy DIY project that I think I'll update some other lamps around my house! One of the last assignments in one of my classes is to make or refurbish/redesign a lamp. I was going to get all creative and make it from scratch by wrapping paper cords around balloons, then pop the balloons and cluster the balloon-shaped paper cord structures together and string lights into them, making them into a ceiling fixture (my idea for this was something I came up with after seeing something similar on this website that I found through Pinterest.) It turns out I don't have time to get this creative, so when I looked for an alternative idea, I found the answer in my living room. I have had this ugly floor lamp for years. It was a group purchase among myself and roommates and was selected for its economical appeal (it came with two table lamps and the whole set was only $25 or less), as well as for its functionality (we desperately needed any lamps, not necessarily beautiful lamps). I somehow ended up inheriting them when the four of us moved apart. A lamp isn't exactly something you can get rid of without replacing it first, unless you like sitting in the dark, and this brown based lamp with beige shade sort of matched my previous colour scheme, so as much as I wanted to throw it ceremoniously to the curb, I wasn't really that motivated to look for a new one. But now that my living room has white walls and a grey couch, it's really got to go. ...Or does it? I am going to redesign it! Very simply, I'm going to spray the base with a chrome spray paint and change the tapered lamp shade to a drum shade and cover the new shade with some houndstooth fabric I bought (pictured below). I hope that when I'm done I'll have a more glamourous lamp than before - a "glamp!" Stay tuned for pics of the finished product!